One of the big pieces of the college experience is living on-campus (and away from your family for probably the first time). While most essentials are provided, like a bed, desk, and chair, there are still little items that make your home away from home a little more functional. That’s why I’m sharing my list of dorm room cooking essentials for college students. Thank you to Dash for sending me these free items! All opinions below are 100% my own. 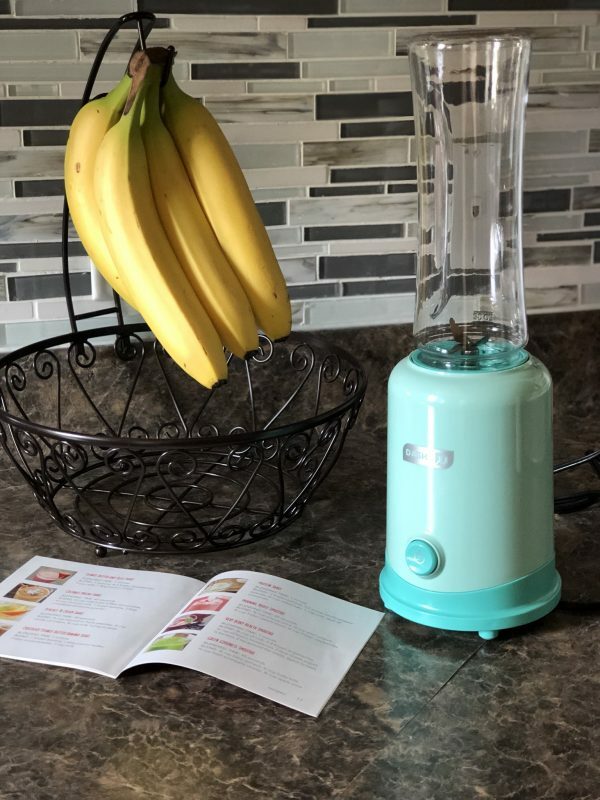 Whether you are in-between classes, looking for a quick and healthy breakfast, or simply want a refreshing snack, you’ll appreciate having a blender in your dorm room. The Dash Sport Blender is the perfect size for small spaces and comes with everything you need. The bottle itself detaches from the base and becomes your to go cup! They even provide you with a lid so you can take your smoothie to class, the gym, or anywhere else you need to go. One of the dorm room cooking essentials you might not think of is an air popcorn popper. While I understand that may seem more convenient, the truth is that microwave popcorn 1) adds up in cost and is more expensive in the long run, and 2) it’s not as healthy as freshly popped popcorn. 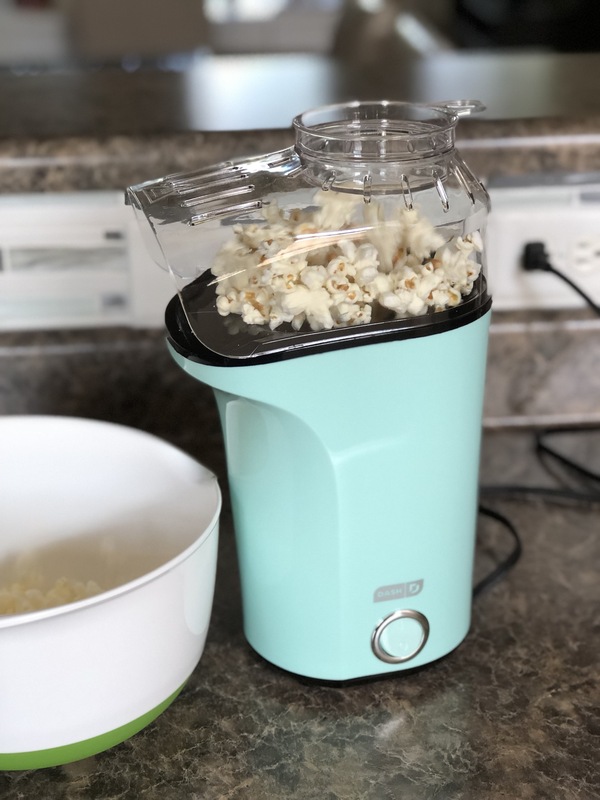 The day I opened my Dash Fresh Pop Popcorn Maker, I used it right away (no joke). I bought a huge package of kernels from the store for less than $5, had my butter and salt ready, so all I had to do was get my bowl out and get to poppin’! If you’ve never used an air popcorn popper before, it’s super simple! Just pour the kernels in the measuring cup on top of the popper, then pour them in the machine and turn it on. In just a few minutes, you’ll have a fresh bowl of popcorn waiting for you! Also, you can add butter to the cup at the top of the popper while you wait for your popcorn to cook and it’ll be nice and melted by the time your snack is ready. I like to add a little bit of sea salt after that, then head over to my bed and start a Netflix binge (please tell me I’m not the only one who has watched To All the Boys I’ve Loved Before 20 times already). You’d be surprised at all the things you can make with a griddle. In the mood for a breakfast spread? Throw an egg on there, some vegetables, and cook until done. Or even make some bacon, a breakfast quesadilla, scrambled eggs, and more! The Dash Express Griddle is a staple if you want a hot cooking surface that is small enough to store in your dorm room, but powerful enough to not take one hour to cook your food. No, this is a not a pot that you use when you’re sick to get yourself decongested (that’s a neti pot, and they aren’t fun). This is actually a dorm room kitchen essential that you never thought of, but absolutely need to have. Or if you’ve graduated and are getting your first apartment or home, you should be adding this to your list as well. Because this thing does everything. If you want to make your own soup, heat up liquid, boil water, cook rice… it literally will do it all. 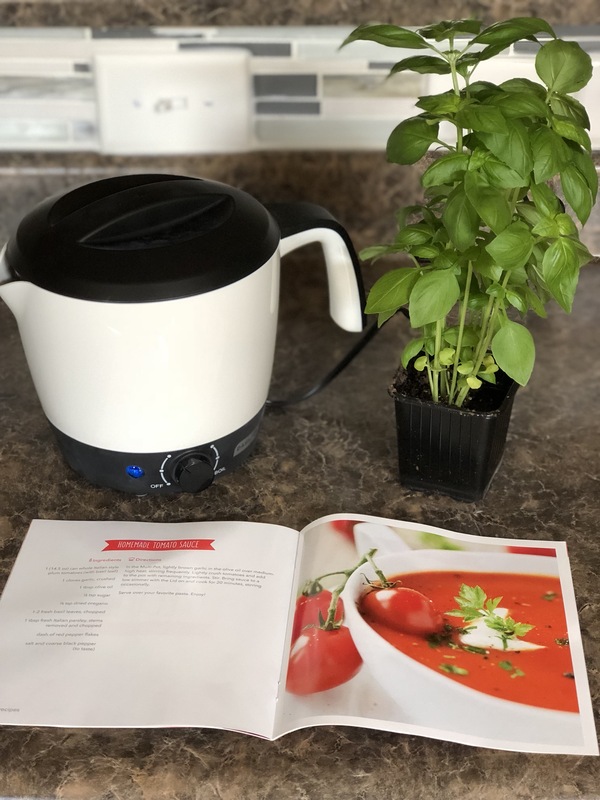 I’m eying the homemade tomato sauce recipe above (which, by the way, every Dash appliance comes with its own recipe book – how awesome is that?! ), and I’ve got my basil plant ready for it (I’m just trying not to kill the poor thing in the meantime…). Here’s the link if you want to pick your own hot pot up at Target! These things are literally ALL the rage right now, and I can see why. I live in the South, and that means that I love my fried food. But when I had to get my gallbladder out in 2012, I had to adjust my fried food intake (much to my dismay), or I’d end up in some serious pain. Thankfully, this air fryer is affordable and allows me to cook some of my favorite treats (hello French Fries and homemade chicken nuggets!) without all of the extra grease. By the way, Pinterest is a HAVEN for air fryer recipes, so you’ll never get bored of making the same thing over and over. I always had issues cooking my rice. I tried so hard in pans and pots and could never find the right cook time. I promise I followed the instructions for liquid – it still never helped. But a few years back I was introduced to the world of cooking with a rice cooker, and my life was forever changed. If you like making burrito bowls (like me), or literally anything with rice, this is an absolute must-have. In fact, I’d probably place this and the sport blender above as my top two dorm room cooking essentials. 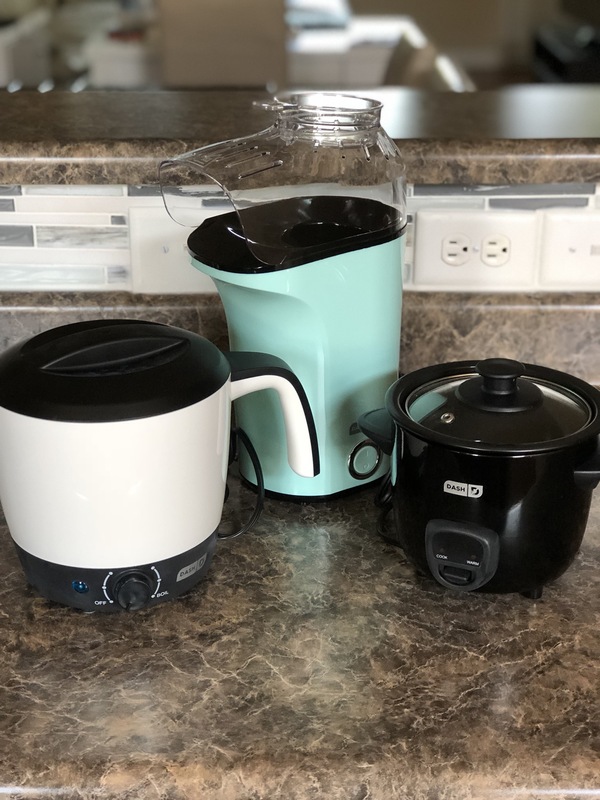 All you have to do is measure your rice, measure your liquid, and flip the switch to “cook.” The appliance does everything else, including keeping your rice warm! So now that I’ve shown you some of my top dorm room cooking essentials, I’d love to hear which one is your favorite, and what recipe you’d like to create with it. Let me know in the comments below!